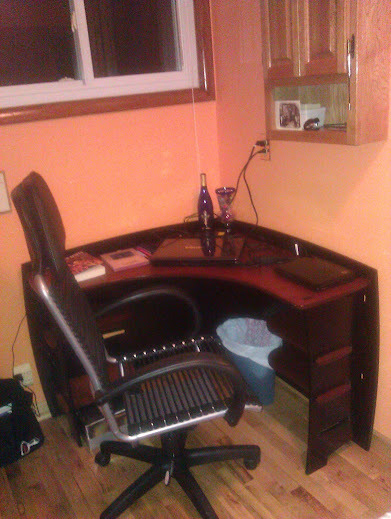 I have a new desk! And I am working towards having an entire office in my new home. I know, it isn’t much, just a tiny corner in a room still filled with Chinese lamps Brian’s storage bins containing miscellaneous items tossed in more or less at random. And I’m not thrilled with the orange walls. But I feel much more productive now that I have a home for my laptops (well, two of them, anyway) and a way to keep a few important tools accessible. Brian even cleaned out the wall cabinet, which I plan to use for storing ink and other such supplies. Now I need to pull some of my bookshelves out of storage, find a nice music stand (preferably one with a place to store music as well as display it), and get a printer stand that will put the printer low enough that I can actually read the control pad. And then I can get started unpacking all those boxes I have stacked in the living room. And I think my bulletin board (also in storage at the moment) will fit on the wall underneath the window, which will expand my thinkspace and hide some of that orange! I think I shall do before-and-after shots of this organizing project, sort of like what my cousin Shannon (a professional organizer) does for her clients. It won’t be a complete “before” picture, because I didn’t think to get a shot of the guest bed (with boxes and laundry piled on it) before Brian’s sister took it to make room for the desk. But since I am pretty much reorganizing the whole house, I will probably do a complete walk-through with a camera today. Don’t worry, though; I will spare you daily blog posts of my progress (or lack thereof).